I invited them to put down their weapons and garden with me, on Saturday. I expressed (legality) concerns about their demands to "stop volunteering and get out of town" on Sunday. On Monday, they threatened, harassed, arrested, and finally beat me and gave me a concussion by slamming my head repeatedly against the pavement. This is NOT FECKING OVER. Power for the people, destroy the abusers. I need to cover some medical bills now. The total is multiple thousands of dollars. I&apos;d be happy if I can just get enough to replace the stuff they destroyed while "performing a takedown" on my unresisting self. Anything helps, but sharing on all the social media helps most. He orchestrated it and is using the others as scapegoats to escape the consequences. Legal fees are going to be over $10k and if the instigators involved (Derick Ramseyer, et al) continue pushing for criminal charges against me, who knows how much "justice" will cost. Drown the Marion County (Oregon) police department in phone calls and paperwork. That&apos;s how we beat this without money. I could really use a boost. Lend me your pennies, and I&apos;ll make them into shields against the abusers who are literally killing our most vulnerable children. Pay me in exposure if you have nothing else to give. Knowledge is power, share the knowledge of my existence with your friends. Hack their feed by asking them to share. We&apos;re strong, but only if we act together. Here&apos;s my initial response to all of the shyte being said about me in the context of the June 4th incident. You have time to read the whole thing. @eryn Your Mountain Lion Foundation link is messed up. Looks like you pasted twice? If you&apos;re at all interested in those events, I do recommend reading the whole thing. ...and there&apos;s a call-to-action near the end, right above "Miscellaneous". The "Miscellaneous" section talks about Tessa&apos;s difficulties as an autist interacting with NTs; also recommended. Oops, forgot to hashtag that update (attached) with #Tessa so it&apos;s findable. Wiki pages will be happening. And somehow I need to get in 3.3 hours of coding time before EoD Wednesday, so I can get paid properly. You&apos;d think this wouldn&apos;t be too difficult, right? Also... the GoFundMe from Sessha is, as I feared, full of highly questionable statements. We&apos;ll be getting into those issues as well, oh yes. @eryn I'm so sorry this happened to you. 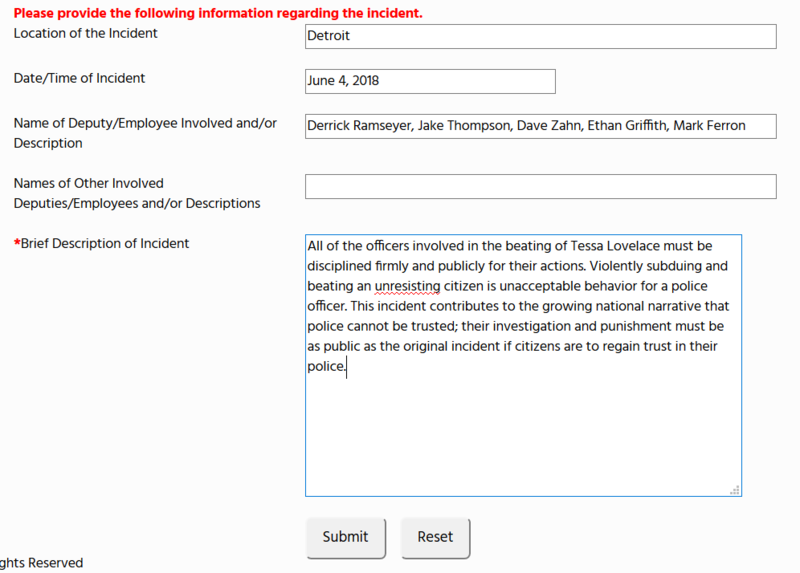 Sent in a citizen complaint.